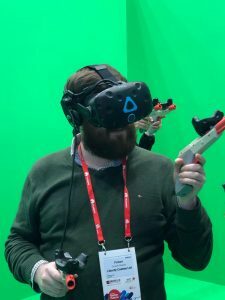 Mobile World Congress Barcelona has once again welcomed thousands of delegates to see the latest innovations, hear from industry leaders and network with the great and good of the technology world. With a healthy selection of AR/VR, 5G, IoT and AI there’s more than enough to get the blood pumping – especially for those of us inclined to appreciate a good abbreviation. This year’s overarching theme is ‘Creating a Better Future’, a concept that ties together devices and content along with the likes of 5G, IoT and AI to highlight the maturity of the global tech ecosystem. In 2018, MWC is about showing how these technologies are all transforming the tech playing field on a global scale. Take 5G for example. According to new GSMA Intelligence research, 5 billion people will be connected to mobile internet by 2025, representing an increase of almost 1.7 billion from today. As 5G quickly turns dreams into deployments, millions of people around the world will enjoy high-speed access to the internet, opening up new possibilities for work, education and leisure. Meanwhile, as 5G grabs the limelight, vendors are turning their attention to the next-generation mobiles to harness the powerful new networks. Nokia in particular impressed onlookers with the reveal of its Sirocco 8 model, showcasing a high-end device that includes wireless charging and an ultra high definition curved display. With day one drawing to a close we’ve already seen flying taxis, next-generation virtual reality (as modelled by Liberty’s very own Finbarr Goode Begley) and more lightning fast connectivity solutions than we ever imagined. Harry is an Account Manager at Liberty Communications.